We regret to have to advise Members that Michael Taylor passed away on Tuesday 4 April at the age of 82. He had been battling with cancer. Michael began racing with an MG TC and a Jaguar SS100 in the mid ‘50s, followed by a Lotus 7 in 1957, but it was with a 1.1 litre Lotus Eleven the following year that he began to make a name for himself at a time when the 1100 cc sports-racing car class was the place to be for aspiring young drivers. His victories at Goodwood in particular earned Michael the Motor Sport Brooklands Memorial Trophy, which had been won several years earlier by Mike Hawthorn, whilst he also shared a Team Lotus Eleven at Le Mans with Innes Ireland, leading the 1100 cc class until the distributor drive sheared on Sunday morning. A visit to Roskilde in Denmark was more productive, Michael winning over the aggregate of several heats. Michael also had the opportunity to drive Alan Brown’s Cooper-Climax T45 in several Formula 2 races in the latter part of the year, finishing fourth in one of three heats of the Berlin Grand Prix at AVUS behind the likes of Masten Gregory, Jim Russell and Jack Brabham. Michael embarked on an ambitious season in 1959, principally with a Lotus-Climax Type 15 and a Lola-Climax Mk 1 in sports car events. There was also a return visit to Le Mans to share a Team Lotus Type 17 with Jonathan Sieff, the car retiring early. A month earlier Michael had shared a works Lister-Jaguar with Peter Blond in the Nurburgring 1000 Ks and was fortunate to escape with slight arm injuries when the car rolled into a field. With the Type 15 Michael won the Grand Prix des Frontieres on the very fast Chimay road circuit near the Belgium/France border and, towards the end of the year, won the Coupe de Paris at Montlhery and the preliminary heat of the Governor’s Trophy at Nassau, finishing fourth in the main race. There were a few opportunities to drive the Alan Brown F2 Cooper T45 again, a particular highlight being fourth overall and first in the Formula 2 category of the Aintree 200 behind the Ferrari Dinos of Jean Behra and Tony Brooks and the works 2.2 Cooper-Climax T45 of Bruce McLaren. He also started, but failed to finish after sustaining transmission troubles, the British Grand Prix at Aintree in what would prove to be his only World Championship Grand Prix. The Lotus Type 15 continued to produce good results in the early months of 1960 including victory at Snetterton and second places at Oulton Park and Silverstone but the plan for the year was to move into Formula 1 for which purpose the prototype Lotus Type 18 was acquired from Team Lotus. This car had made its debut with Innes Ireland in the Argentinian Grand Prix and, in F2 guise, had won at Oulton Park. Its first race in Michael’s hands was the BRDC Daily Express International Trophy at Silverstone when it was plagued by a misfire and finished too far back to be classified. The next race should have been the Belgian Grand Prix at Spa-Francorchamps. However, during the Saturday practice session, more or less simultaneously with Stirling Moss’s Type 18 crashing heavily when a stub axle broke, the steering column of Michael’s Type 18 failed and the car plunged into the trees, Michael sustaining very serious injuries from which he ultimately recovered but he never raced again. Understandably in the circumstances, legal action was taken against Lotus and eventually Michael received financial compensation from its insurers. Later Michael competed in some of the early long-distance rallies. In 1968 he shared a Mercedes 280E with Innes Ireland and Andrew Hedges in the London to Sydney Marathon, winning the award for first private entrant to reach Bombay but retiring in Australia. 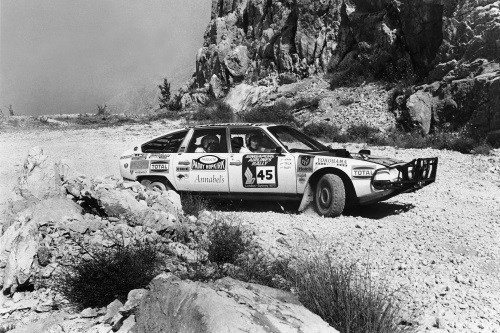 In the repeat Marathon in 1977 he shared a Citroen CX2400 with Paddy Hopkirk and Bob Riley to finish third. Michael is survived by his wife Elaine, son Luke, daughter Emma and stepdaughter Allison to whom the BRDC extends its sincerest condolences. The funeral will be held on Friday 21 April at 11am at St Peter's Church, 119 Eaton Square, London SW1W 9AL. All Members are welcome.